We welcome your information that upon approval can appear in a variety of church publications, both print and digital. Announcements are due Tuesday evening by 8pm of the week before you want to see it in print on Sunday. 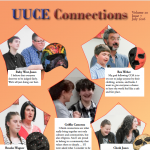 NOTE: The UUCE Weekly eBulletin, usually sent by email on Friday by church staff, has graphics, information about the upcoming Sunday service, a link to the Sunday Handout on the church website, and information about several upcoming activities with some links for additional information. To submit an announcement about your group or committee plans, you would include the Title-Who-What-When-Where-Why-Link-Contact information, as briefly – though invitingly – as you can. (We still may edit it.) All information must deal with church-related issues or events. Any fundraising activities must meet UUCE Sales Policies and be approved by the Operations Team (Minister, Business Manager, Treasurer) at operations@uueugene.org. 1. Event title and brief description. 2. Day(s), date(s), start and end time. 4. If there is a charge for the event, please mention that too. 5. Reference a webpage or newsletter article where further information is available. 6. Contact info: sponsoring Ministry/group, plus contact person first and last name, email, phone. 7. Exact Sundays on which you want your announcement to be used. 8. Please re-check that the day and date match, then send to publications@uueugene.org by 8pm on Tuesday of the of the week before you want to see it in print on Sunday. Indicate in the subject line which publication you are addressing (Newsletter, Sunday Handout/Weekly eBulletin, or both). Articles and photos are due on the 20th of each month for use in the newsletter the following month. The monthly newsletter is intended to notify the congregation of your group’s meetings, events, goals, and progress. 1. You might review the styles of entries in previous newsletters: https://uueugene.org/about-us/newsletter/. 2. Include the Title-Who-What-When-Where-Why-Link-Contact information (sponsoring Ministry/group, plus contact person first and last name, email, phone). If there is a charge for the event, please mention that too. 3. A selection of good quality, web-style photos by email are very welcome. 4. Send your article and photos by the 20th of any month to publications@uueugene.org. Indicate in the subject line which publication you are addressing (Newsletter, Sunday Handout/Weekly eBulletin, or both). 3. DIGITAL MEDIA SUBMISSIONS GUIDELINES. You are welcome to contact us at office@uueugene.org any time with information for the website, Facebook, Twitter, or Instagram.